Here are 6 tips from a stone restoration pro for keeping it looking beautiful. 1. Dust Mop. Dust Mop. Dust Mop. Sand and grit carried in on shoes can cause tiny scratches when walked on, which is what takes that beautiful shine away. one of the most common, but very erroneous recommendations for cleaning natural stone is to use vinegar. The fact is, anything acidic will damage marble and other calcite base stones. 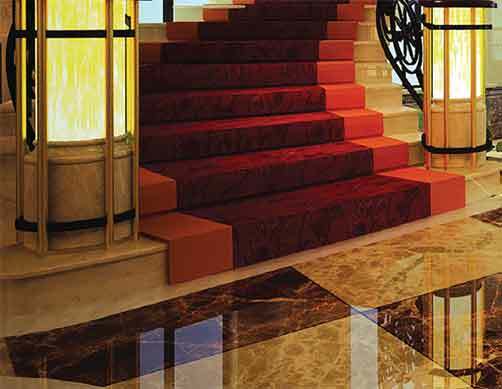 Be careful to only use quality cleaners designated safe for natural stone. Easy, but effective habits, can make an incredible difference in the appearance of your stone. For example, placing coasters under drinking glasses—particularly those containing alcohol or citrus juices—can help prevent etching. Using place mats under china, silver, and other hard or heavy objects or trivets under hot dishes can prevent scratches and damage to table tops, bar tops, and countertops. Avoid dragging heavy furniture across floors. If a spill sits too . ing on the surface of your natural stone, don’t use scouring powders, green scrubbing pads, steel wool, or other abrasives. The silicon carbide grits in them can scratch even the toughest granite. Spray stone-safe cleaner on the spill and allow it amble time to dwell to soften the dried on spill. Be careful when using certain cleaners around your natural stone—such as mirrors over your marble vanity, on glass shower doors over your marble floor, or on toilets sitting on a marble floor. Overspray or drips can cause etch damage to the stone surface. There are a couple of ways you can prevent damage to your natural stone caused by overspray or dripping of cleaners made for non-stone surfaces. The first is to use stone-safe, neutral cleaners that won’t harm your natural stone. The second is to place a protective barrier, such as a towel or some plastic, on surrounding areas. For more information call 615/ 351-4676 or visit www.tnstonecare.com.